Product #20580 | SKU JB01277 | 0.0 (no ratings yet) Thanks for your rating! 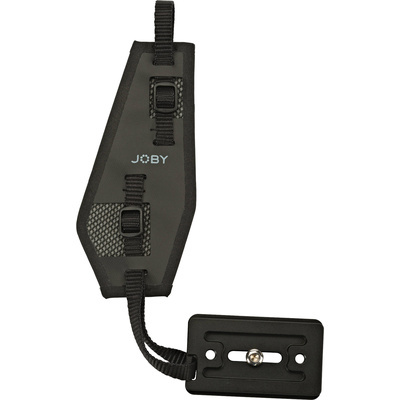 The black and grey UltraFit Hand Strap with UltraPlate from Joby allows you to comfortably carry a DSLR or mirrorless camera in your hand or connect it to a tripod via the included Arca-Swiss style quick-release plate. This quick-release plate attaches to the base of your DSLR via its 1/4"-20 threaded hole and clamps directly onto a tripod. The hand strap has a 0.4" wide nylon attachment belt that secures to the side lugs or eyelets of your camera. The belt has buckles that allow you to tighten or loosen the distance from your hand to the camera's body. There are two 1/4"-20 attachment points included on the UltraPlate that allow you to secure a sling strap or another camera accessory to the hand strap. The UltraFit Hand Strap is compatible with most DSLRs, mirrorless cameras, and tripods.